RV camping comes with many perks but it’s not like going for a walk in the park. One of the most tedious and painful RV chores is doing the laundry. Think about a weekend RV outing and the number of dirty clothes it leaves you with when you get home. So, what will happen when you are gone for two months or do full-time RVing? For this reason, it is necessary to find a travel trailer with washer and dryer because you certainly don’t want to waste your free time sitting at a Laundromat. Many RV parks and campgrounds offer laundry facilities but there is no way you are getting it done without getting into a line. Also, whether it is a self-service or a campground laundry facility, you will need to have enough pocket change to do the laundry. 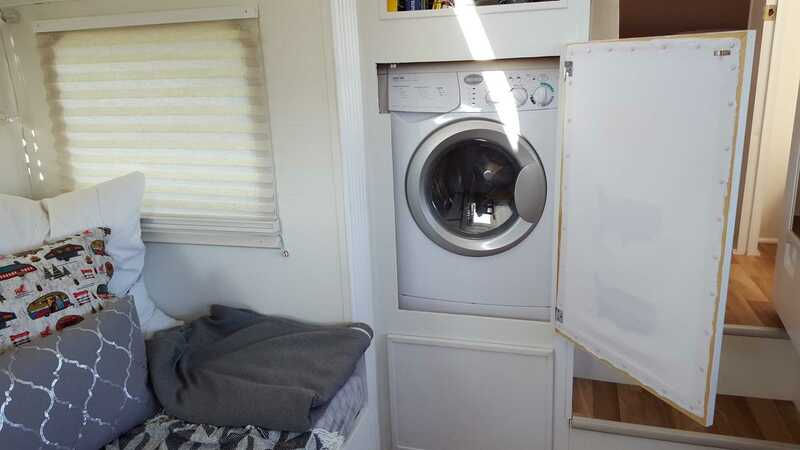 Campers with washer and dryer could be the best solution for doing laundry on the road. Some RVs have a closet with fittings for a washing machine. It’s a mini home away from home. The 102-inch body structure has plenty of interior space. The roof is extra strong that can tolerate 4,500 pounds of weight. Featuring lots of luxury options and amenities, the residential-style travel trailer is one of the most comfortable units of its class. The spacious master bedroom ensures sound sleep at night with Simmons pillow-top mattress and high-quality bedspread. The living and kitchen zones are in an open area that is decorated with a high ceiling, LED lights, and a sliding patio door. The RV has a large bathroom with generous storage. There is a stowing compartment with a washer/dryer prep. It also has a central vacuum and these appliances together keep your motorhome and clothes neat and clean. Some other Jayco models also have the washer-dryer combo such as Jayco Precept 36T and Jayco North Point 375BHFS. 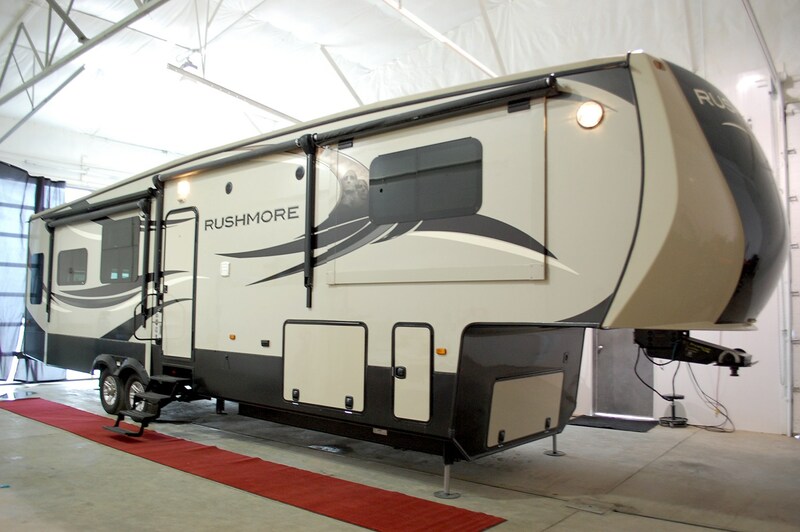 Highland Ridge RV has a broad category Open Range fifth wheels and travel trailers. These motorhomes come with a select model of washer-dryer combo unit so that cleaning dirty clothes has never been a chore when you are on the road. With a 100-inch wide body structure, the motorhome offers lots of space for the dwellers to feel it like another home. There is a huge living space and you will certainly appreciate some features like a fireplace, outside kitchen TV, LED ceiling lights, water pump with attached filter, and more. The 2017 Recreation model from the Design Navigation NV2 is another travel trailer with washer dryer. With a 32 feet long body structure, this will end the quest of those who have been looking for a family bunkhouse trailer with the facility for cleaning and drying clothes onboard. Other features include a spacious living room slide, microwave, awning, interior and exterior speakers with audio and video systems, and two LP tanks with 60 lbs capacity. 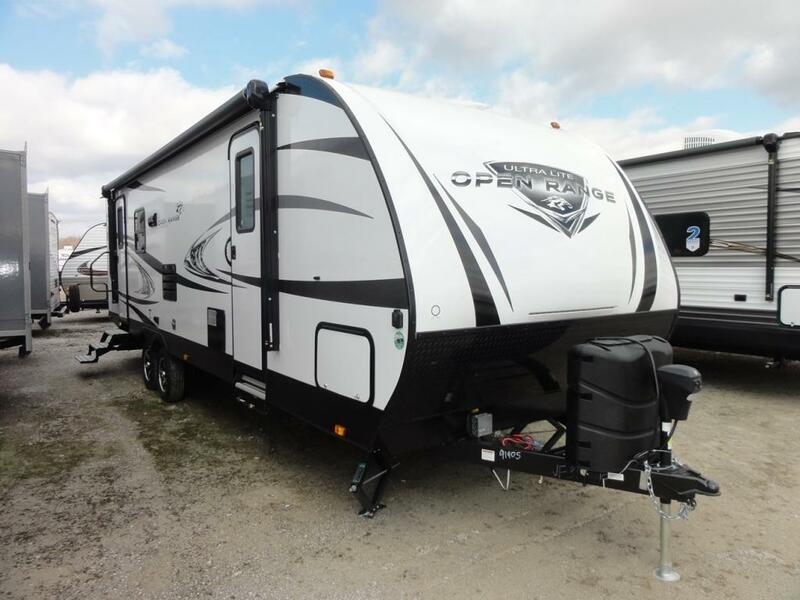 Keystone RV is another brand that manufactures several models of fifth wheel and travel trailer with washer and dryer. Montana 3121RL is one such model that comes with a combo OR 2 piece washer/dryer and each appliance has a separate 20amp circuit. 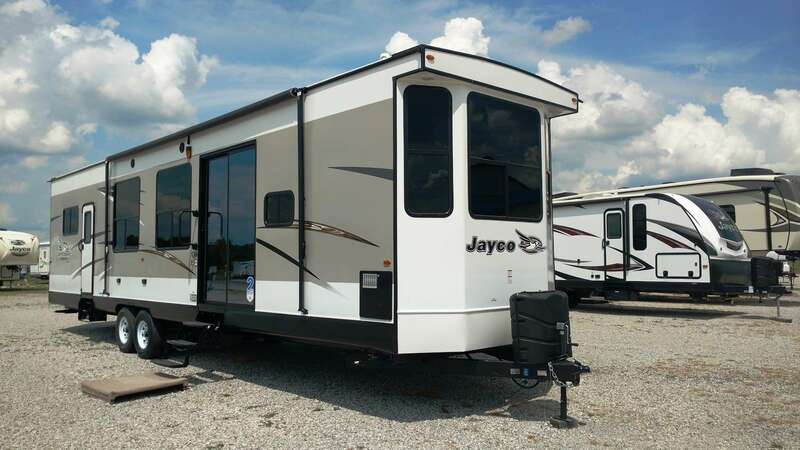 The 35 feet fifth wheel can accommodate four people, so it is perfect for a small family. Other notable features include a large living space with a theater seating and fireplace, a spacious kitchen, LED interior lights, electric tank heaters, vented attic, and more. 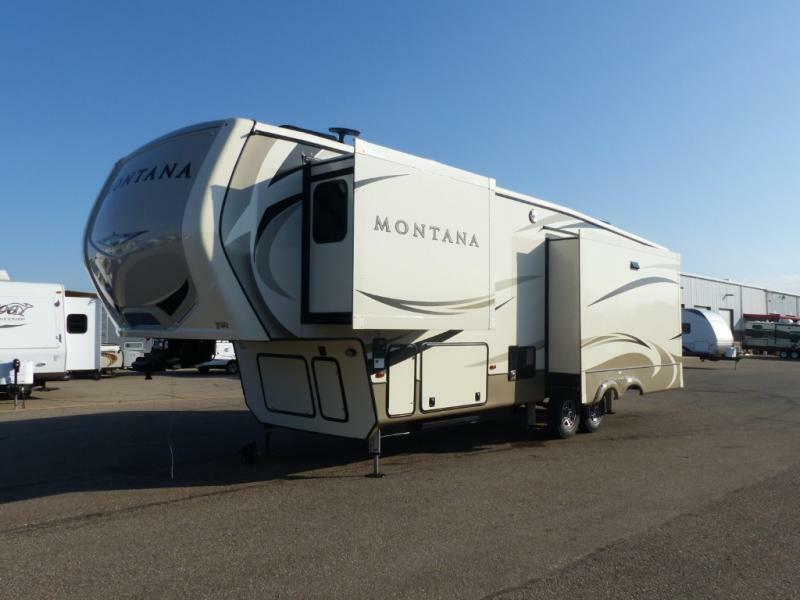 This model is larger than the brand’s luxurious line of fifth wheels and is ideal for a small family. 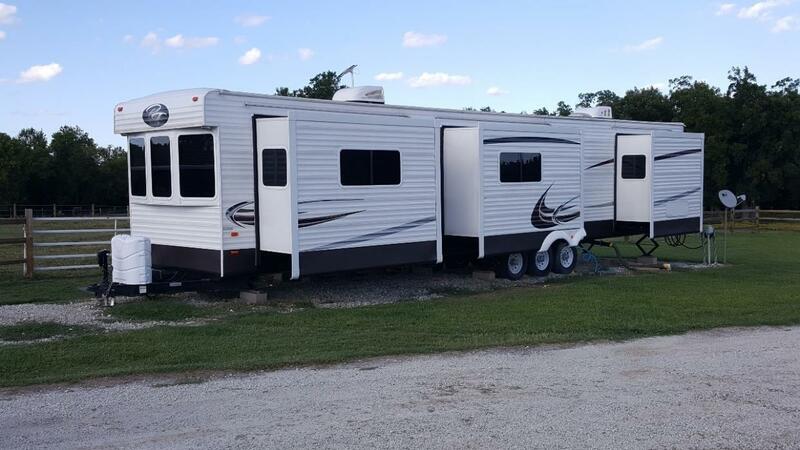 With 39 feet 11 inches and 8 feet 6 inches interior ceiling, it is perfect for those travelers who want an RV or travel trailer with washer and dryer. The bedroom is equipped with a queen bed but there is room for a king size mattress, the living area has a large entertainment center and a couple of seating arrangements. The open-plan kitchen is highly functional with a dual-sink island, a huge refrigerator, and a spacious pantry. A mini travel trailer with washer and dryer is something hard to find because the appliance eats up lots of valuable space. You can still install one but not without sacrificing another place such as the living space with sofas and entertainment area. The suitable option for such vehicles is a portable washer-dryer combo. A portable washer is handy because you can do the washing anywhere with access to an electrical outlet, sink, and drain. Portable dryers also take very small space. Despite their compact design, they are equipped with multiple features including a damp sensor, heating options, and drying cycles. Some of the best portable washer-dryer combo units are Do mini portable compact twin tub, Giantex mini washing machine, and Costway portable washing machine.